Perhaps needing a distraction from the fiscal folly of today's $1.3 trillion monster spending bill... or perhaps looking to show progress ahead of tomorrow's expected-to-be-huge "march For Life" across America, President Trump has swung his Oval Office ax at another Obama-era law and followed through on his promise to ban bump stocks. ASHINGTON - Today, Attorney General Jeff Sessions announced that the Department of Justice is proposing to amend the regulations of the Bureau of Alcohol, Tobacco, Firearms, and Explosives, clarifying that bump stocks fall within the definition of "machinegun" under federal law, as such devices allow a shooter of a semiautomatic firearm to initiate a continuous firing cycle with a single pull of the trigger. "Since the day he took office, President Trump has had no higher priority than the safety of each and every American," said Attorney General Jeff Sessions. "That is why today the Department of Justice is publishing for public comment a proposed rulemaking that would define `machinegun' to include bump stock-type devices under federal law - effectively banning them. After the senseless attack in Las Vegas, this proposed rule is a critical step in our effort to reduce the threat of gun violence that is in keeping with the Constitution and the laws passed by Congress. I look forward to working with the President's School Safety Commission to identify other ways to keep our country and our children safe, and I thank the President for his courageous leadership on this issue." On February 20, 2018, the President issued a memorandum instructing the Attorney General "to dedicate all available resources to... propose for notice and comment a rule banning all devices that turn legal weapons into machineguns." This NPRM is in response to that direction, and would make clear that the term "machinegun" as used in the National Firearms Act (NFA), as amended, and Gun Control Act (GCA), as amended, includes all bump-stock-type devices that harness recoil energy to facilitate the continuous operation of a semiautomatic long gun after a single pull of the trigger. 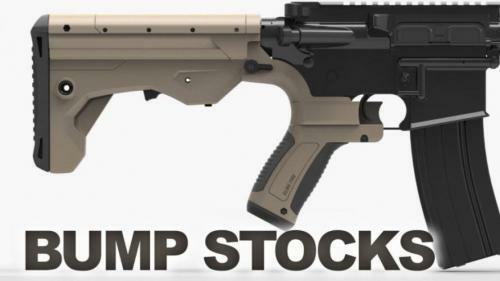 If the NPRM is made final, bump-stock-type devices would be effectively banned under federal law and current possessors of bump-stock-type devices would be required to surrender, destroy, or otherwise render the devices permanently inoperable. The comment period for the NPRM is 90 days from the date of publication in the Federal Register. He argued that such a ban could be extended to triggers, magazines, or semi-automatic firearms.